Is the Day of the Land Attack Cruise Missile Upon Us? 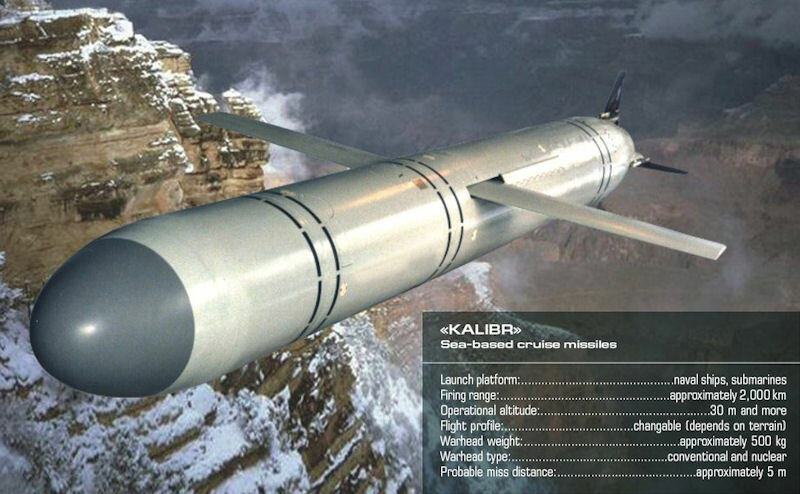 Kalibr is a family of cruise missiles very similar to the US Tomahawk cruise missile, first fielded in the 1980s. Kalibr exists in different versions (land-attack and anti-ship) and can be launched from different types of platforms, such as surface ships and submarines. The landattack version is designated the 3M14 in Russia and the SS-N-30 by NATO, while the anti-ship version is known as the 3M54 in Russia and the SS-N-27 Sizzler by NATO. The fact that the Kalibr can be launched from compact vertical tubes means that the system can be fitted to ships as small as corvettes, providing a quantum leap in the precision long-range land-attack fire power of the Russian Navy and giving it a capability hitherto only possessed by the US Navy. The Caliber family of missiles was created on the basis of two projects developed during the period from 1975 to 1984 in the Novator CMCB of the 3M10 strategic nuclear cruise missile with a combat radius of 2500 km and the competing anti-ship missile "Alpha". Initially, only the Yakhont supersonic rocket took part in the OCR "Turquoise" competition, but its development was delayed and the rocket became expensive. At the same time, the SSC-4 Slingshot 3M10 "Pomegranate" project had problems due to the planned INF Treaty. The Innovator Design Bureau, on its own initiative, in 1986 proposed a non-nuclear version of the KS-122 offshore missile. However, it did not meet acceptance from the selection committee due to the subsonic attack speed. The work was continued, and in 1990 a finished version with a supersonic terminal accelerator appeared to overcome the enemy’s defense systems. However, the beginning of the collapse of the USSR suspended the introduction of this product. In parallel, the development of an anti-submarine complex based on the KS-122 was also carried out to replace the bulky and outdated Vodopad and Rastrub-B complexes. The first version of the rocket in this direction was introduced in 1997. For the general public, the Caliber family rocket was first introduced at MAKS-93. The 3M-14, part of Russian contractor Novator’s Club-A series, is a land attack cruise missile. The land attack variant is designed to strike pre-programmed targets such as seaports, airfields, and command posts. The 3M-14AE missile has a range of 300 km. The missile is modular with five versions: two anti-shipping models, one for land attack and two anti-submarine variants. he conventionally armed missile has a range of 2,500 km (1,600 mi), while the nuclear tipped Kalibr has a greater range from 2,000 km to 2,600 km (1,200 to 1,600 mi). In Syria, when launched from the Caspian Sea, missiles had a range of at least 1,500 km. Working with the photos of the launches of these missiles, it becomes clear that the missiles have a launch size of about 8 meters - similar to cruise missiles 3M10 "Pomegranate", which are already in the Navy arsenal from 1980-1990. It is believed that in the Navy, these missiles are designated 3M14 and are part of the fire weapons complex "Caliber-NK". Klub missiles are reduced range versions of the Kalibr systems that can be exported without violating the MTCR. The 3M14E (E for export) Klub is a reduced range (~300 km) version of the 3M14 Kalibr that Russia used to strike Syria (, with a range of 2,000 km). The development of the 3M-51 Alpha anti-ship cruise missile with an additional combat stage for launching submarines from the torpedo apparatus was started by the Novator Design Bureau in the context of the ROC Turquoise based on the 3M-10 cruise missile of the Granat 3K10 complex in 1983. In 1993 a model of the 3M-51 Alfa missile was demonstrated at the arms exhibition in Abu Dhabi (UAE) and at the MAKS-93 air show in Ramenskoye. In 2013, Russian defense ministry started equipping of Project 971 Schuka-Band Project 877 Varshavyankasubmarines with Caliber ruise missiles capable to hit land-based targets at the range of 300-2,500 km, reports Izvestiya. According to the newspaper, "Russian Navy will thereby obtain a capability to attack land targets. By the way, the missiles are launched by common 533-mm torpedo tubes". The first Caliber-equipped diesel-electric submarine would be B-261 Novorossiysk (Project 636.3) being currently built at Admiralteyskie Verfi shipyard in St. Petersburg. She would be followed by diesel subs Rostov-na-Donu and Stary Oskolin 2014-2015. After that, it was planned to plant Caliber missiles on Project 877 Varshavyanka submarines in service at Northern Fleet's 165-th brigade. The next-generation warships will be most likely be equipped with a Caliber high-precision cruise missile system and a S-500 Prometey antiaircraft defense system, which is more capable than US Aegis Ballistic Missile defense systems. The missile corvettes Buyan-M from project 21631 are in combat forces of the Russian Caspian Fleet. These nimble ships equipped with jet engines with the displacement of only 950 tons, can even be based on Volga river, if necessary. They are specifically designed as river-sea ships. But most importantly, in spite of their small size, they are also equipped with the Caliber missile system with eight missiles in the vertical launcher. Assuming they will be armed with conventional missiles with a range up to 300 km, it was not clear against whom Russia is going to use them in the Caspian Sea. 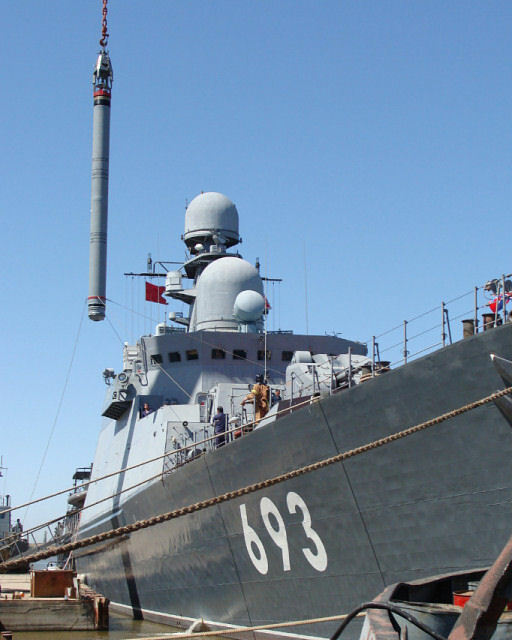 One such missile can sink a destroyer, but none of the Caspian countries has ships of this class. Conventional missiles can only destroy ground targets on territories of Azerbaijan, Turkmenistan, Kazakhstan and Iran, which is absolutely unnecessary today. But if it is assumed that Buyan-M will be equipped with the new long-range missiles, such as Novorossiysk Warszawianka, then everything at once falls in place. The missile ship "Dagestan" was the first ship of the Russian Navy armed newest missile complex "Caliber-NK" designed for missile strikes against naval targets at distances up to 350 km and 2600 km shore. 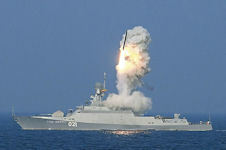 Having missiles armed with a range of Red Banner Caspian Flotilla becomes operational naval strategic association type. This makes it possible to adopt to solve problems outside the area of responsibility while interacting with other species and genera of the Armed Forces of the Russian Federation. The complex "Caliber" traces its history since the 1980s, but for all the time and has not been put in service with the Russian Navy, and only in the mid-2000s, developers have continued to improve for the missile complex. The first launch of the missile complex "Caliber-NK" was held on board the Republic of Kazakhstan "Dagestan" in spring 2012. As part of the strategic command-staff exercises "Caucasus-2012" in September 2012. "Dagestan" re-launched cruise missiles spent hitting the shore goal. After firing the complex was finally adopted by the Russian Navy. The weight of the warhead cruise anti-ship missile 3M14 was in service of the complex is more than 200 kg. 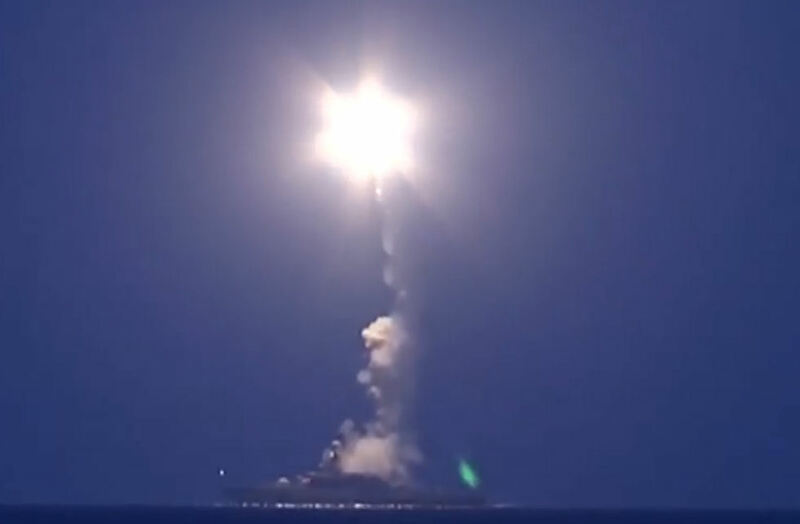 "Calibre" cruise missiles, fired by the ships of the Caspian flotilla Navy Russia on "Islamic State" targets in Syria, hit targets with an accuracy of up to three meters, according to the official website of the Russian Defence Ministry. The missiles were launched by missile ship "Dagestan" of the project 11661 and small missile ships of the project 21631 ("Buyan- M") "Sviyazhsk", "Uglich" and "Great Ustyug", according to the Ministry of Defense. The rocket ship "Dagestan" (project 11661) with a full-load displacement of about 2000 tons, length of more than 100 meters, is armed with modern high-precision missile system Caliber MK cruise missile. Some reports indicated that the Russian (apparently 3M-54 “Klub”) missiles were fired during the nighttime hours between October 6 and October 7, from two missile boats operating in the Caspian Sea The Pentagon reportedly identified the missiles as SS-N-30, and while US intelligence officials had been aware of an earlier model known as the SS-N-27, the range demonstrated in the raid caught some officials off-guard. Some Western analysts were also surprised by the fact that such long-range missiles were successfully fired from relatively small naval ships. The SS-N-30 was said to be comparable to the Tomahawk missile, and in the US Navy, those are fired from vessel with a length of at least 500 feet. Russia’s cruise missiles were fired from ships as small as 200 feet. “The effective range of the Russian cruise missiles came as the biggest surprise as the 1,500 kilometers they covered before hitting their targets is at stark variance with their declared range of just 300 kilometers,” the BBC quoted Russian military expert Andrei Soyustov. The Russian cruise missiles are likely of the 3M-14 Biryuza variety and not the Kaliber, as had been reported, Stratfor said. The bodies are similar but the missiles have different warheads and operational software. The Intermediate-Range Nuclear Forces Treaty signed by Moscow and Washington in the far 1987, still prohibits Russia from deploying land-based missiles with a range greater than 500 km. But this prohibition does not apply to surface ship based missiles. This means that nine Buyans armed with these weapons, will be able to destroy up to 72 targets at a range of over 1,500 km in one salvo. On 08 October 2015, CNN reported that four of the 26 missiles fired from Russian warships in the Caspian Sea went off target and crashed in Iran. That report was based on anonymous Pentagon sources, who despite claiming to have evidence of the targeting malfunction, could not identify where, precisely, the missiles landed. "No matter how unpleasant and unexpected for our colleagues in the Pentagon and Langley was yesterday's high-precision strike on Islamic State infrastructure in Syria, the fact remains that all missiles launched from our ships have found their targets," ministry's spokesman Maj. Gen. Igor Konashenkov said. The Russian Ministry of Defense stated "If one assumes that a new long-range land-attack cruise missile is an expensive commodity, why would you employ it if there was a cheaper way of striking a target? The Russian defense ministry has been touting the successes that its Syria-deployed air assets have achieved since strikes first began last week. As long as Russian aircraft have unfettered access to the targets from the air, they can use much cheaper ordnance than the SS-N-30. According to one source, India paid USD 6.5 million per unit for the export version of the missile, but that sounds exceedingly high: a single U.S. Tomahawk LACM only cost USD 1.59 million in FY2014. Despite the possibly overstated cost in the report, it is logical to assume that missiles cost more than air-delivered bombs in Russia, as they would anywhere else. An analyst at the Institute for the Study of War in Washington says the LACM strike “was specifically done to show bravado... it’s chest-thumping.” Well, that’s at one end of the spectrum. At the other end of the spectrum, some analysts assert that Russia is using this opportunity to prove its latest military weaponry can be employed to solve modern day missions. " The Russian submarine Rostov-on-Don fired a salvo of Kalibr cruise missiles from the Mediterranean Sea against Daesh targets in Syria on 08 December 2015. The Russian Defense Ministry released a video of this first-ever submarine launch of Kalibr cruise missiles. The missiles, launched by the Russian submarine Rostov-on-Don from the Mediterranean Sea, obliterated two Daesh (ISIL) command posts in Syria. Vladimir Putin praised the Russian cruise missiles fired against terrorists in Syria from the sea. He expressed hope that these weapons would not have to be armed with nuclear warheads.